(b) Western blotting showing that PKC inhibitor increased GLT-1 and GLAST expression in MPP+-treated astrocytes. Results are expressed as the mean±S.E. of at least three experiments. One-way ANOVA. **P<0.01, *P<0.05, #P<0.05. *Represents a significant difference between other group and control group; while #represents a significant difference between the indicated group and MPP+-treated astrocytes for 24 h.
Chelerythrine is a potent, selective antagonist of PKC with IC50 of 0.66 mM. Daphnetin, a natural coumarin derivative, is a protein kinase inhibitor, inhibits EGFR, PKA and PKC with IC50 of 7.67 μM, 9.33 μM and 25.01 μM, respectively, also known to exhibit anti-inflammatory and anti-oxidant activities. C57/BL6 mice (5 mice/group) were intraperitoneally injected with daphnetin (DFN, 5 mg/kg) or DMSO, and then challenged with LPS (37.5 mg/kg) or saline. 16 h after LPS challenge, mice were sacrificed, and then lung and serum were collected. c, Representative photomicrographs showed H&E staining of lung tissue. 2-Methoxy-1,4-naphthoquinone, isolated from the leaves of Impatiens glandulifera, specifically suppressed the expression of PKC βI, δ, and ζ in a concentration-dependent manner in Raji cells. Myricitrin, a flavonoid compound isolated from the root bark of Myrica cerifera, which exerts antinociceptive effects. LY333531 is a β-specific protein kinase C inhibitor. It competitively and reversibly inhibits PKCβ1 and PKCβ2 with IC50 values of 4.7 and 5.9 nM respectively. 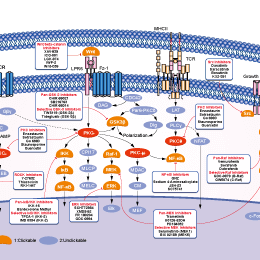 Midostaurin (pkc412) is a multi-targeted kinase inhibitor, including PKCα/β/γ, Syk, Flk-1, Akt, PKA, c-Kit, c-Fgr, c-Src, FLT3, PDFRβ and VEGFR1/2 with IC50 ranging from 80-500 nM. (f and g) Induction of apoptosis in HMC-1.1 and -1.2, respectively. Columns represent the mean of three independent experiments and the bars represent the standard error. ctrl, control; mido, midostaurin. Ingenol, a plant-derived diterpenoid, is a weak PKC activator and possesses important anticancer activity. Decursinol angelate is a cytotoxic and protein kinase C activating agent from the root of Angelica gigas.